Rhode Island Deputy Governor Darius Sessions (1769-1775) can truly be considered one of the outstanding patriots in the troubled times leading up to American Revolution. His befuddling of the British-appointed committee investigating the burning of the Gaspee in 1772 by Rhode Island citizens saved the necks of those involved in the raid, while probably saving the liberal charter of Rhode Island from being revoked by King George III as well. Darius Sessions was born August 17, 1717, in Pomfret, Connecticut to Nathaniel Sessions (8 AUG 1681) and Joanna Corbin (1686). His family was apparently quite well-to-do, as they owned large tracts of land in Eastern Connecticut. He graduated from Yale College in the class of 1737, and subsequently engaged in mercantile business in Rhode Island. In 1750, Sessions married Sarah Antram of Providence, with whom he had ten children . Darius Sessions was part owner of the Providence based privateer sloop Reprisal in 1746 during King Georges War2aa. We do find a brief annotation that he served as the master of the schooner Smithfield in 1750, then plying the waters of West Indies2a. He was likely involved to some extent in the distillery business of his father-in-law, William Antram, whose stillhouse was located just North of Sessions's home in Providence2b. In July of 1763 he was advertizing land for sale near Weybosset Street on the west side of the Great Bridge. Sessions apparently was active in the circles of Brown University and became a close friend of its first president, James Manning. Sessions has been credited with locating of Brown University in Providence, using his influence in interesting the Brown family and others. An attempt had been made to locate the institution at either Newport or Warren, but Providence seemed better suited for the home of a large university3. SIR:—The inhabitants of this town have, of late, been much disquieted in their minds, by repeated advices being brought of a schooner which for some time past hath cruised in the Narragansett Bay and much disturbed our Navigation. She suffers no vessel to pass, not even packet boats, or others of an inferior kind, without a strict examination, and where any sort of unwillingness is discovered, they are compelled to submit, by an armed force. Who he is and by what authority he assumes such a conduct, it is thought needs some inquiry, and I am requested, by a number of gentlemen of this town, on their behalf, to acquaint your Honor therewith, and that you would take the matter into consideration and, if the commander of that schooner, has not as yet made proper application and been duly authorized in his proceedings, that some proper measures be taken to bring him to account. It is suspected he has no legal authority to justify his conduct, and his commission, if he has any, is some antiquated paper, more of a fiction than any thing else, and this seems to be confirmed by Mr. Thomas Greene, who says he saw it, and believes it to be no other than the commission the famous Reid had, who lost his sloop at Newport, or something else of no validity. In consequence of the above mentioned application, I have consulted with the Chief Justice thereon, who is of opinion, that no commander of any vessel has any right to use any authority in the Body of the Colony without previously applying to the Governor and showing his warrant for so doing and also being sworn to a due exercise of his office—and this he informs me has been the common custom in this Colony. This initiated a chain of threatening correspondence between Wanton and the commander of the Gaspee, Lieutenant William Dudingston, and Dudingston's superior, Admiral John Montagu. After the incensed colonists attacked and burnt the schooner on the night of June 9-10, it was Darius Sessions who led the group of ranking officials to conduct the first investigations into the matter. Sessions proceeded to diligently interview Dudingston and his crew, and to offer the State's assistance and outrage in the matter. It quickly became apparent to all that the attack by Rhode Island citizens could result in severe retribution by the British onto their colony. The day after the Gaspee burning, Daniel Jenckes, Chief Justice of the Inferior Court of Common Pleas for Providence County, advised Sessions to attend to the matter immediately. If they did this, he felt nobody could blame Rhode Island's civil officials for approving or permitting the attack . It was decided that, at very least, Rhode Island officials must take visible steps to assuage the King that all appropriate steps were taken to catch the culprits that burned one of His Majesty's schooners. To demonstrate that a good faith effort was being made, Sessions advised Governor Wanton to publicize a reward for the capture of the raiders. But, Deputy Governor Darius Sessions hardly cooperated further with the British. In fact, he developed plans from very early on to confound any attempts to find and punish the attackers. Although the names of some of the participants of the expedition must have been known to him, Sessions' dispatch to Governor Wanton telling of the grave incident asserted that the names of the attackers were unknown. It should also be noted, that Sessions applied for and received compensation from the Colonial legislature for his trip to Pawtuxet and sending the crew of the Gaspee back to Newport in the amount of 9 pounds, 1 shilling. The commanders of the attack on the Gaspee, Abraham Whipple and John Brown, had already instructed their crews never to discuss the event. But it was Sessions and Hopkins and the like that coordinated the efforts to lose evidence, threaten potential witnesses, and discredit those that did appear before the commission. Sessions and his cohorts made sure that other potential witnesses were informed to either refuse to appear before the commission (by pleading ill health, bad weather, bankruptcy, and the like) or to deny any knowledge of the case. Sessions took great pains to attack the reliability of Aaron Briggs and Stephen Gulley. Briggs was the black indentured servant whose testimony, while clearly suspect, gave the names of several of the attackers. Gulley, a Smithfield farmer who claimed second-hand knowledge of the attackers, related in his testimony the existence of a 'Vigilance Committee' that threatened reprisals to anyone giving testimony or identifying the raiders8. It is noteworthy that, by and large, the rest of the Rhode Island citizenry also kept quiet about what was known despite the fact that identities of the attackers were known to many, but the vast majority of local people were supportive of the attackers. Per their instructions, the commissioners turned over their collected evidence to the Rhode Island Superior Court for indictments, if warranted. Rhode Island Justice Heime attributed the failure of a grand jury to be charged and to conduct an investigation simply to his own 'forgetfulness'. Chief Justice Stephen Hopkins found that the depositions "do not induce a probable suspicion" and asked the commissioners if they were "of a different sentiment." The commissioners, holding to the narrowed interpretation of their powers, replied, "We decline giving any sentiment or opinion in the matter. "10 They felt that it was for the Rhode Island court to judge the matter and for the Rhode Island Deputy Governor to act upon it (which, of course, Sessions never did). In June 1773, the Commission of Inquiry into the Burning of the Gaspee closed up frustrated, without a single indictment being handed down. Rhode Islanders, and their precious Charter, were saved. During the American War of Indepedence it is known that Darius Sessions clearly sided with the revolutionary causes, and returned to his farm in Connecticut which he had purchased in 1761. Sessions had the farm house totally reconstructed into a stately colonial mansion. Governor Sessions also took much pains with his grounds and farm, making, according to (Brown University) president James Manning, "Truly Wonderful" accommodations. In this fine country seat many patriots found a safe retreat from the constant alarms and perils of the seaboard, making it almost a war office and place of general consultation16. Darius, February 8, 1759; not buried in RI. He ran packet sloops between Providence and Philadelphia c1815, partnered in the Bicknell & Sessions mercantile firm, and owned a gin distillery on India Point. The census comparison is only slightly off from Darius Sessions' known family. He might have had a niece staying with him. The Gaspee Days Committee proudly recognizes Rhode Island Deputy Governor Darius Sessions as an 'unindicted co-conspiritor' in the Gaspee Affair. 1Munro, Wilfred H. Memorial Encyclopedia of the State of Rhode Island. American Historical Society, Boston, 1916, p134. 2Carroll, Charles. 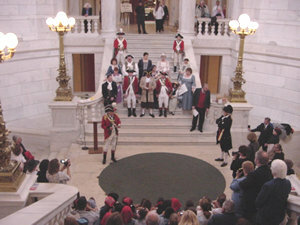 Rhode Island: Three Centuries of Democracy. Vol. I, p235. 2aaChapin, Howard M. Rhode Island Privateers in King George's War : 1739-1748 Providence: Rhode Island Historical Society :, 1926, p182. 2aHedges, James B. The Browns of Providence Plantations: Colonial Years. Cambridge, Harvard University Press, 1952. Page 11. 2bCherie Antrim-Bell <cherbearbell@charter.net>, personal communication e-mail, October 2003. Cherie is a descendant of the Antram family that Darius Sessions married in to. 4Staples, William R. The Documentary History of the Destruction of the Gaspee, p3. 5Staples, p20. It is the considered opinion of Royal Navy historians in the United Kingdom, that, given the time period and historical context, the Gaspee would rightly be referred to as His Majesty's Schooner Gaspee, or simply, HMS Gaspee. 'His Majesty's Ship' would be reserved for those vessels with three or more masts. Many thanks for e-mail on this point from the crew of H.M.S. 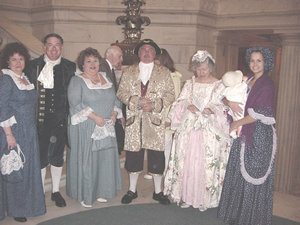 Richmond, a virtual re-enactment group. 6Letters from Samuel Adams to Darius Sessions, Dec. 28, 1772 & Jan 2, 1773. 9Robinson, Natalie. Revolutionary Fire: The Gaspee Incident. 11Deasy, Richard M. Introduction to Documentary History of the Destruction of the Gaspee, p.xxix. 14See Biography of Governor Joseph Wanton. 16Larned, Ellen D. History of Windham County, Connecticut. Worcester, Mass. : Charles Hamilton, 1858, p761. 17Larned, Ellen D. Historic Gleanings in Windham County, Connecticut, 1899, p149. 18RI Historical Cemetary Reference: PV001: North Main Street, Providence. 20 feet West of telephone pole #140.